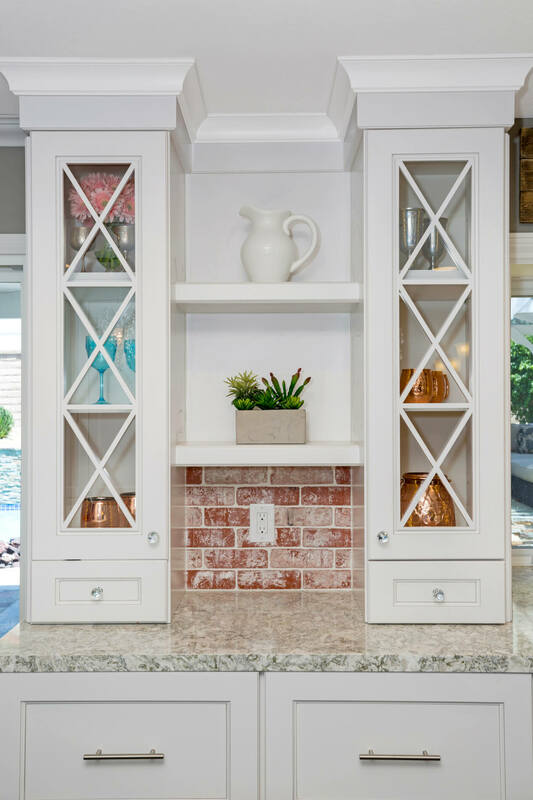 When designing a kitchen, open shelving provides numerous options. It’s functional, providing storage and organization to a kitchen. It contributes to the look and feel of the room, allowing our clients to express their personality by showcasing works of art, pottery, collectables, cookware, chinaware, glasses, plants, flowers, herbs and objects d’art. Living walls create an art piece from sustainable vertical gardens indoors and outside as well. In relation to kitchen design, you can install living walls that do not require watering, natural light, fertilizer or pruning. In addition to being exceptionally cool and visually stunning, vertical gardens help absorb sound, preventing conversations and acoustics from the kitchen from traveling to other rooms in the home.